Father’s Day & Mom’s Birthday brunch at 1-9. 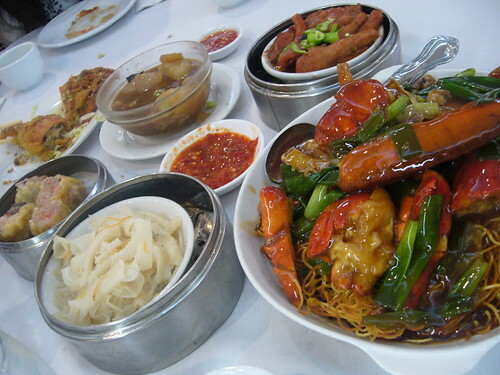 In Edison, there’s only one dimsum place that my family goes to – 1-9 Seafood. Their food is consistently good, service is decent, and if you get there early enough, the wait isn’t too long. Today though, since it was Father’s Day, every seemed to have the same idea about brunch and when we got to the restaurant it was a 45 minute wait, longer than we’ve ever had before. My sisters and I amused ourselves by watching the Japanese-style reality show on the large-screen tvs, where poor contestants had to climb rolling piles of logs and vault their way over giant ponds. As each one of them smashed their faces into the ground or fell into the water, the entire restaurant would break out into fits of laughter and forgot about their food. I guess that’s why management changed the channel to CNN shortly afterwards. Food-wise, there were new items that I’d never seen before at 1 and 9 – most of them lightly fried like soft shell crabs and baby squid. 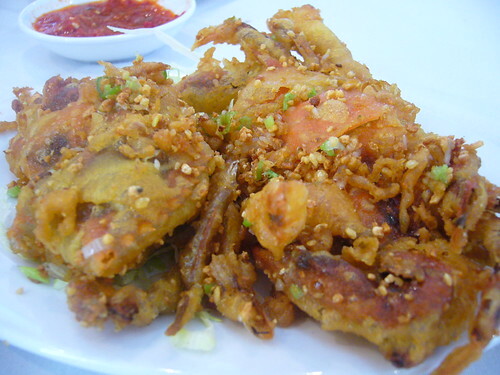 They tasted almost exactly the same as the fried frog legs they serve during dinner but were still quite delicious. It’s pretty hard to make anything deep-fried in flour, salt, and pepper taste bad. Old favorites like shrimp in rice rolls, shrimp-stuffed eggplant (or is it the other way around? I’m too full to really care), and tripe with radishes were also present and met expectations but disappointments, however were the spring rolls, which had barely any filling at all and just oozed grease the minute I bit into one of them and the not-so-fresh-or-hot shumai dumplings that I ate anyway. 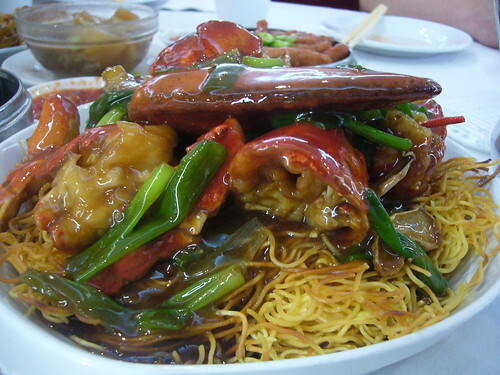 This isn’t a dimsum item but I highly recommend it anyway: lobster pan-fried noodles. Yes, it’s hard to eat but that wonderful sound when you crack into the crispy noodles and smother them in the lobster sauce is simply music to a food-lover’s ears. 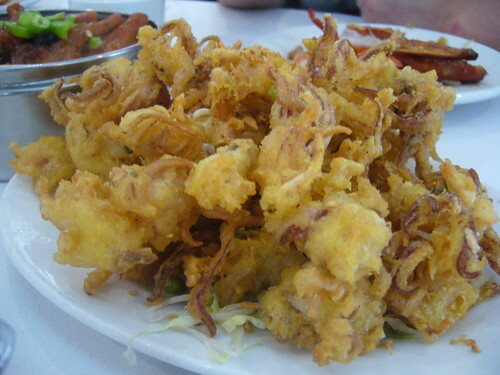 A lot of restaurants have something similar, more likely with all different kinds of seafood like scallops, squid, octopus, etc. Try it next time if you see it on the menu! § One Response to Father’s Day & Mom’s Birthday brunch at 1-9. 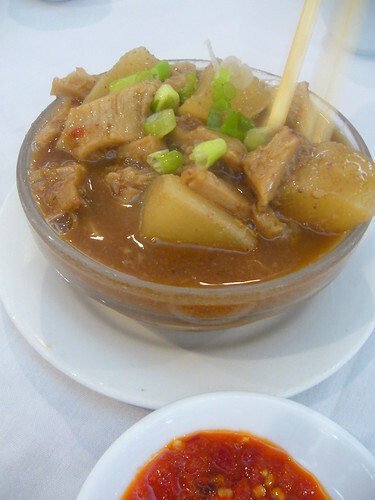 Oh lord, 1-9 has some of the best Chinese food in the area (surpassed only by Wo Hop in Chinatown). I hope you paid with cash. You are currently reading Father’s Day & Mom’s Birthday brunch at 1-9. at Notes on Food.